Background: In spite of significant improvements in the treatment of breast cancer, many women still undergo mastectomy. 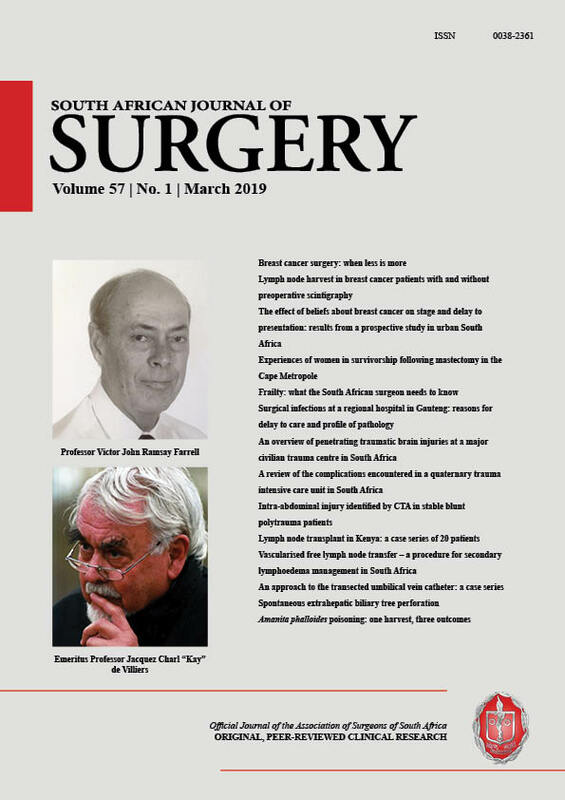 The effects of breast cancer surgery on the diverse population of South African women have not been well studied. Insight may be gained in how to aid recovery in survivorship by identifying the support needs f women following mastectomy. This study aimed to explore and describe the lived experiences of women in the Cape Metropole following mastectomy in survivorship. Methods: A qualitative study guided by descriptive phenomenology and grounded in the post positivist philosophy of Husserl. Seven women from the Cape Metropole were interviewed in English following ethical approval. The semistructured interviews were thematically analysed. Results: Three general themes emerged: Psychological impact of breast cancer diagnosis and treatment, the impact of an altered body image and concern for family and reliance on them for support, with a theme specific to stigmatisation within the Xhosa culture. Conclusion: The need to shield family members from breast cancer diagnosis was contrasted by the need for family support. Cultural stigmata still prevail within the South African population.